Nash Bryan continued his torrid start to the season with 17 kills as the Butler boys volleyball team downed Baldwin 25-17, 25-20, 23-25, 25-18. 26-24, 23-25, 25-27, 25-16 and 15-11. Gabe Baroffio tallied 26 assists in the victory, Keenan Krause 15 passes, Matt Huey 18 kills and seven blocks and Matt Rudzki 17 kills. Matt Huey had 12 kills as the Butler boys volleyball team swept North Hills 25-16, 25-17, 25-15 . Adam Paterno added 21 assists for the Golden Tornado (2-0, 1-0), which also swept the junior varsity match 25-20, 25-11. The Butler boys volleyball team won the North Hills Invitational, nipping Beaver County Christian 2-1 in the finals. The Golden Tornado went 11-1 in round-robin play, including wins over South Park (2-0), Farrell (2-0), Obama Academy (2-0) and Canon-McMillan (2-0). Butler beat Obama 1-0 in the semifinals to reach the finals. Matt Huey led the Golden Tornado with 38 kills while Andrew Paterno had 66 assists. Chris Fiorina had a team-high 25 digs, while Josh Kaufman led Butler with 19 passes. Defeating the visiting Pine Richland Rams 3 games to 1. The Tornado took game 1 (27-22), lost game 2 (24-26), won game 3 (25-17) and game 4 (26-24). Setter Andrew Paterno had 45 assists for the Tornado, while senior Matt Huey had 23 kills and junior Keenan Krause had 9 passes to target.. The Butler Boys Volleyball team after two tough 5 game losses to the 5th state ranked North Allegheny Tigers and the 7th state ranked Fox Chapel Foxes continued their brutal schedule by taking on the 6th state ranked Seneca Valley Raiders. This time the Tornado would not be denied toppling the Raiders in four games by the scores of 22-25, 25-19, 25-17 & 26-24. Matt Huey continued his record breaking season had 20 kills while Andrew Paterno had 40 assists. The Tornado finished the first half of the season with a record of 6-2 overall and 4-2 in section. Andrew Paterno had 34 assists and Matt Huey added 11 kills as the Butler boys volleyball team opened up the season with a 25-15, 25-16, 25-20 win over North Hills. The 2013 Butler Boys Volleyball team recorded their second straight win by defeating the visiting Shaler Titans 3-0 by the scores of 25-12, 25-18 & 25-17. Andrew Paterno recorded 27 assists, Rob Kunst had 8 kills, Chris Fiorina 9 passes and Matt Huey 6 block kills. The Butler Boys Volleyball team raised their overall record to 3 & 0 by defeating the Pine Richland Rams on the road last night 3 games to 2 games. The Tornado took game 1 (25-17), lost games 2 & 3 (25-27 & 24-26), but came back to win games 4 & 5 (25-17 & 15-10). Andrew Paterno had 3 aces and 41 assists, Matt Huey had 4 block kills and 14 kills and Chris Fiorina had 14 passes to target. Butler hosts North Allegheny Thursday 4/4 at the Butler Sr. High School gymnasium. Andrew Paterno had 25 assists in the Butler High boys volleyball team's 3-0 victory over host Gateway. Luke Bryan and Matt Huey both added 10 kills and Chris Fiorina 10 digs for the Golden Tornado (4-1) who swept the Gators by scores of 25-12, 25-15 and 25-15. Butler's junior varsity team also won, 2-1. The Butler Boys Volleyball team opened their 2012 season at home last night hosting the North Hills Indians. The Butler JV started the action by sweeping the Indians in two straight games by the scores of 25-12 and 25-17. The Varsity also swept their match in three games by the scores of 25-11, 25-12 and 25-12. 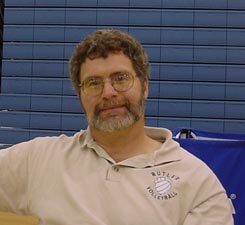 Steve Stauffer had 16 assists and 8 kills for Butler while Xavier Krause had 13 passes to target and 10 kills for the Tornado. Butler goes on the road Thursday night traveling to Shaler to take on the Titans. The Butler Boys Volleyball team defeated the Fox Chapel Foxes in three straight games by the scores of 25-22, 28-26 & 25-17. Xavier Krause had 15 Kills and 4 Block Kills. Steve Stauffer and Cole Chamberlain both had 11 assists while Josh Kaufman started Butler's offence by having 18 passes to target. The Tornado is now 5-1 overall 4-1 in section. 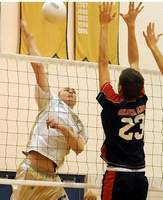 The Butler Boys Volleyball team opened their 2011 season on the road traveling to North Hills. The Butler JV started the action by sweeping the Indians in two straight games by the scores of 25-12 and 25-20.
by the scores of 25-14, 20-25, 25-13 and 25-20. DeFrancisis recorded 30 assists for Butler, Mike Dreher had 15 kills and Dylan Snodgrass had 12 passes to target. 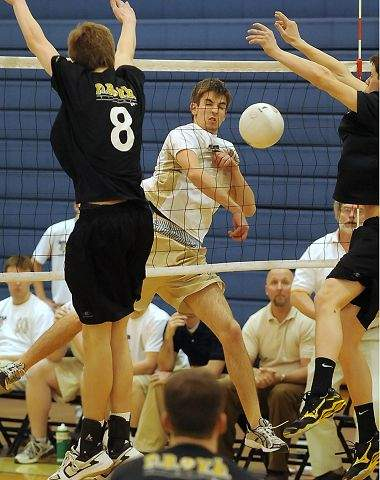 The Butler Boys Volleyball team hosted the Shaler Titans last night opening up their 2011 home schedule. The Butler JV started the action by sweeping the Titan in two straight games by the scores of 25-11 and 25-21. The Varsity continued Butler’s winning ways by winning their match three games to none by the scores of 25-12, 25-7 and 25-12. Dustin DeFrancisis recorded 31 assists for Butler, Mike Dreher had 22 kills and Dylan Snodgrass had 12 passes to target. Both Butler Boys Varsity and Junior Varsity Volleyball teams participated in the North Hills invitation tournament Saturday with both teams came away with the first place trophy. The varsity went undefeated throughout pool play while defeating North Hills and Seton SeSalle in the playoffs. Mike Dreher had 22 kills, Xavier Krause had 19 kills and Dustin DeFancisis had 94 assist for the day. The Jr. Varsity went 6-2 in pool play and went on to defeat Moon, North Hills and Seton LaSalle to win the championship. The Butler Boys Volleyball traveled to Pine Richland last night to take on the Rams. Sweeping their best of five matchup by the scores of 25-10, 25-10 and 25-8. Dustin DeFrancisis recorded 52 assists, Mike Dreher had 12 kills while Bill Smith had 5 blocks for the Tornado. Butler continues section play Thursday night at home hosting the North Allegheny Tigers. The Butler Boys Volleyball team hosted Hempfield Friday night. The varsity continued their winning ways by defeating the Spartans in three straight games by the scores of 25-13, 25-19 and 25-17. Xavier Krause had 11 passes to target and 14 digs while Dustin DeFrancisis, 25 assist, and Mike Dreher, 12 kills, added to their respected team leading totals. The JV lost their matchup by the scores of 22-25, 25-19 and 13-15. 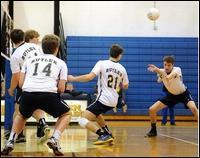 The Butler Boys Varsity volleyball team participated in the Fox Chapel invitation tournament Saturday. The varsity went 10-2 overall throughout the day. In pool play they went 5-1 defeated Peters Township, Plum and Bethel Park. In the playoffs, Butler also went 5-1 defeated Fox Chapel and Penn Trafford before capturing the championship against Central Catholic in the finals 2-0. The Butler Boys Volleyball team continued section play traveling to Fox Chapel to take on the Foxes. The JV started the contest by losing their matchup in two tight games by the scores of 24-26 and 23-25. The Varsity won their best of five matchup 3 games to 1 by the scores of 25-22, 24-26, 25-17 and 25-19. Mike Dreher and Xavier Krause both had 11 kills a piece, Dustin DeFancisis had 39 assist and Dylan Snodgrass had 12 passes to target. Butler goes back on the road today traveling to Bethel Park to take on the Hawks. to power Butler to a 25-11, 25-12, 25-3 victory over Pine-Richland. The junior varsity team also won 25-13, 25-18. The Butler Boys Volleyball team began the first round of the WPIAL playoffs last night by taking on Baldwin at Seneca High School. The Tornado swept the match 3 games to none by the scores of 25-20, 25-19 & 25-19. Dustin DeFrancisis had 25 assists while Mike Dreher chipped in 10 kills and 9 passes to target and Xavier Krause 7 service aces. Butler continues their playoff run Thursday night at Deer Lakes High school taking on the winner of the Bethel Park and Plum first round matchup. 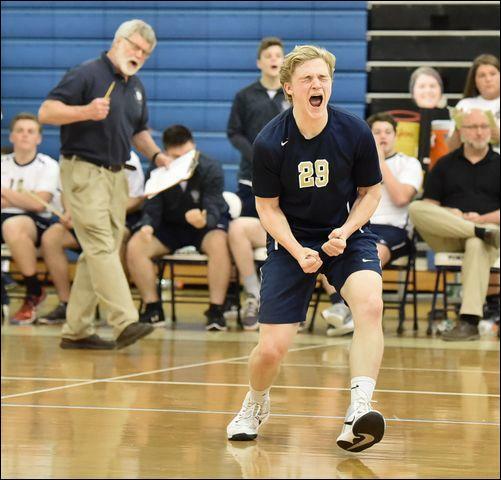 The Butler Boys Volleyball team took on the #5 seeded Bethel Park Hawks last night at Deer Lakes High School in the second round of the WPIAL platoffs. The best of five match up went back and forth all night but in the end the Tornado came away with the match victory three games to two by the scores of 23-25, 25-21, 25-22, 23-25 and 15-12. Dustin DeFrancisis had a Butler high record 51 assists while Mike Dreher had 24 kills and Xavier Krause and Nelson Johnson both had 15 passes to target. Butler continues their playoff run playing in the semi finals next Wednesday against the North Allegheny / Penn Hills matchup. The Butler Boys Volleyball team began their 2010 season at home by hosting the North Hills Indians. The Tornado swept the match winning in all three games by the scores of 25-13, 25-17 and 25-15. Seniors, Joshua Houston (15 kills), Anthony Lewis (20 passes) and Spencer Koehring (4 blocks) lead the way for Butler while Junior Dustin DeFrancisis had 23 assist. The team continues section play today traveling to Shaler to take on the Titans. The Butler Boys Volleyball team continued section play traveling to Shaler to take on the Titans. Butler pulled out a victory in the best of five match up, three games to two. The 1st and 4th games went to Shaler 25-22, 25-23, while the 2nd, 3rd and 5th games to Butler 25-17, 25-18,15-13. Leading the way for the Tornado was Dustin DeFrancisis with 32 assists, Mike Dreher with 24 kills, Spencer Koehring with 10 blocks and Anthony Lewis with 22 passes. swept the Titans 25-17, 25-9, 25-15. Spencer Koehring added five blocks for Butler (2-0). The Butler JV team won 25-17, 22-25, 15-9. Andrew Willison had 32 kills and Billy Roberts 20 kills and 16 blocks to spark the Butler volleyball team to capturing the 12-team Norwin Tournament. The Golden Tornado ended up No. 1 in their regular pool, then were re-bracketed as the No. 2 seed. They defeated Latrobe and Bethel Park, then dropped a decision to Deer Lakes. As the No. 2 team entering the quarterfinals, Butler defeated Our Lady of the Sacred Heart and Hempfield by 1-0 scores before avenging its loss to the Lancers in a 1-0 championship final triumph. Chris Geigle had 11 kills and 10 aces and Spencer Goehring added 12 blocks for Butler. as the Tornado (3-0, 3-0) swept the Rams 25-19, 25-15, 25-15. In JV play, Butler won 2-0 as Xavier Krause and Steve Stauffer had 12 and 11 assists, respectively. Thank you for your interest in the Golden Tornado Sports. We're upgrading our stat pages to provide you with better information. This site, www.goldentornadosports.net is dedicated to bringing the viewer as much information as possible about each and every sport supported by Butler Athletics. All information regarding Butler Athletics is generated by students and parents who seek to provide the very best updated material for all to view. We invite you to submit any appropriate material by clicking the below address and attaching, doc. 's, photo's and other pertinent information related to the sport of your choice. Thank You.